Chief captain Cedric Earthboy jets past Falcons’ defense in Friday’s closely played league game. 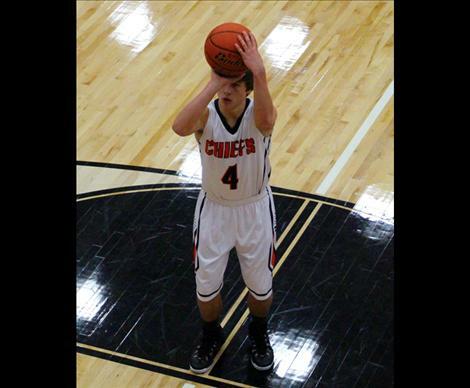 Chief July Sorrell shoots to score at Friday’s home contest against Florence. 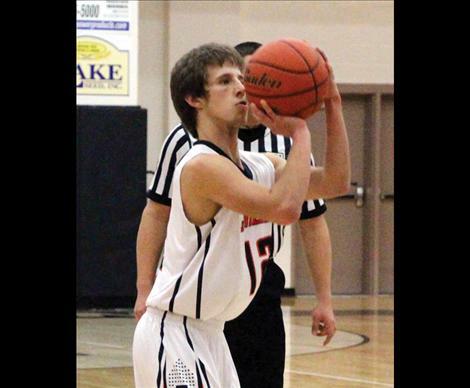 Sorrell was top scorer in both last week’s games. Chief Colton McCrea has proved to be a leader on the Ronan team. RONAN – If you were to ask locals what they thought of last season’s run on the court for the Chiefs, you might get mixed reviews. 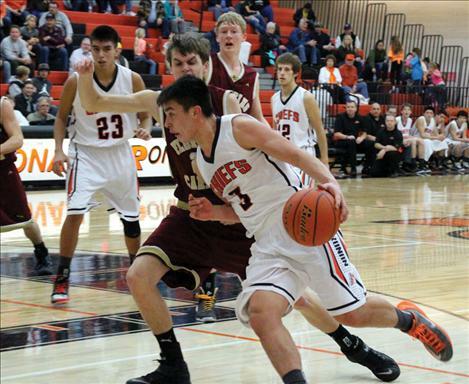 This season, however, has seen vast improvement with the Chiefs already ahead of the battle, posting one more win than all of last year — and with plenty of basketball left to play. Though the Chiefs are still a tad below the .500 mark at 5-7, they have made progress with each game and, according to Head Coach Steve Woll, losses have not been blowouts. Every game has been hovering below the eight-point spread, most just missing the prize by less than three points, giving the Chiefs just that much more to strive for. After posting a 4-15 season last year, the Chiefs have picked up tactics that lead to victories, but not without hard work coming from the athletes that make up Ronan’s basketball roster. 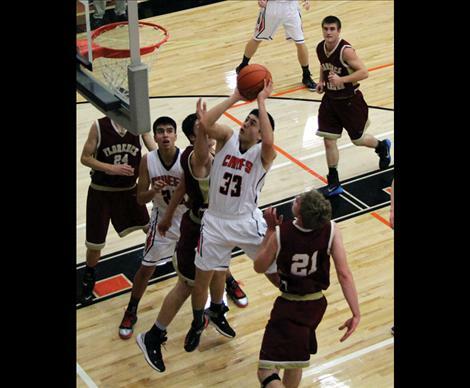 With team co-captains Cedric Earthboy and Colton McCrea providing leadership and teammates Justin Krahn, Jeremiah North Piegan and up-and-comer July Sorrell making noise on the hardwood, the Chiefs are posing a surprise threat to the tough 6-B conference. At home Friday, the Chiefs hosted Florence, top dogs in the 6-B conference, in a contest that just barely missed the mark in the 43-45 tumble. After Ronan went into the second frame tied with the Falcons, Florence found the upper hand before halftime, giving them the edge to secure the win. Sorrell and McCrea posted double digits for the Chiefs with Sorrell netting 14 and McCrea 13. 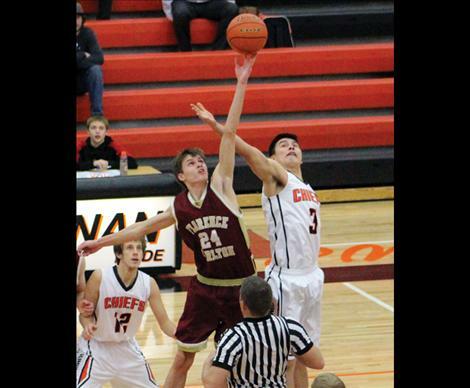 Saturday the Chiefs lost a tough battle against the Lions in Eureka with a final score of 54-67. After a slow first half the Chiefs picked up momentum in the second, matching the Lion’s frame scores, but it wasn’t enough to come home with the victory. 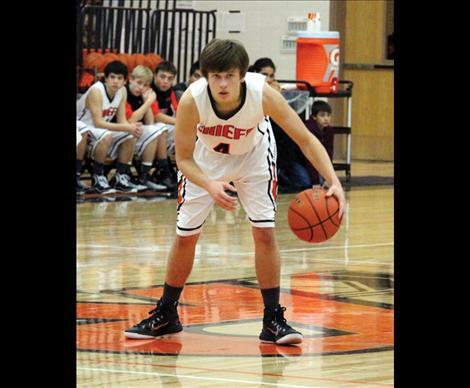 Despite the loss, Sorrell tossed in 16 for the Chiefs while North Piegan came away with 13. Earthboy added 10. As the Chiefs truck into the final third of the season, they remain optimistic about postseason, knowing that their hard work has helped them to pick up steam along the way. They hope to place third or above in conference to avoid a play-in game. Woll said his Chiefs’ success comes from the kids “trusting in the system and learning their roles,” and he is not ready to give up the fight the Chiefs possess that can take them to the next level. 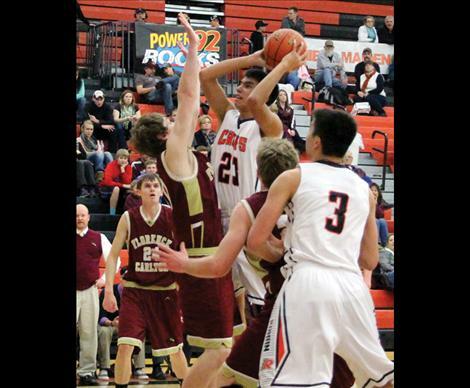 The Chiefs will take their attack mode to a home game against Corvallis on Friday. July Sorrell 14, Colton McCrea 13, Jeremiah North Piegan 7, Cedric Earthboy 5, Rhett Duffey 3, Bryce Cullen 1. July Sorrell 16 Jeremiah North Piegan 13, Cedric Earthboy 10, Bryce Cullen 5, Jayce Nenemay 4, Colton McCrea 3, Rhett Duffey 3.